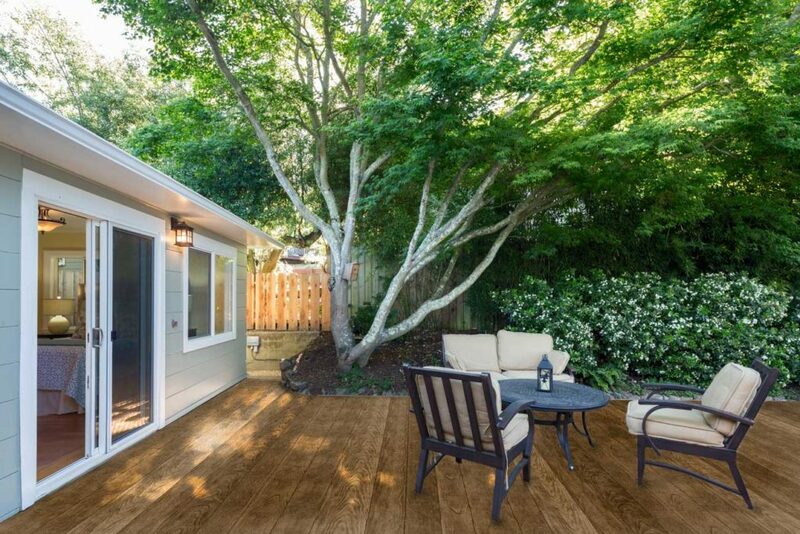 The short answer- we like to call it “luxury vinyl outdoor flooring”. IntelliDeck is a waterproof deck membrane that is .060” x 72”. 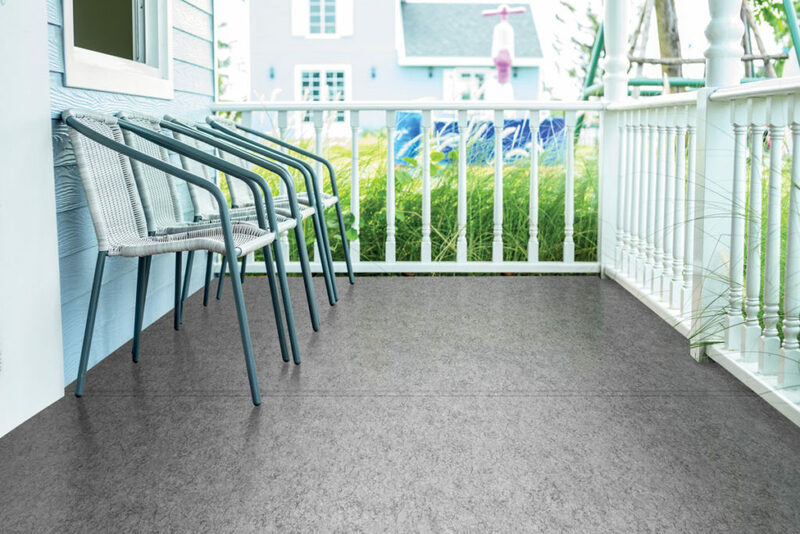 It has a PVC layer that is printed with attractive designs to complement any deck, especially those over living spaces. It has a 3 ounce non-woven polyester back layer to promote glue adhesion. The long answer- IntelliDeck is an ideal one-step solution for waterproofing roof top decks, balconies, and any structures that utilize living spaces underneath. 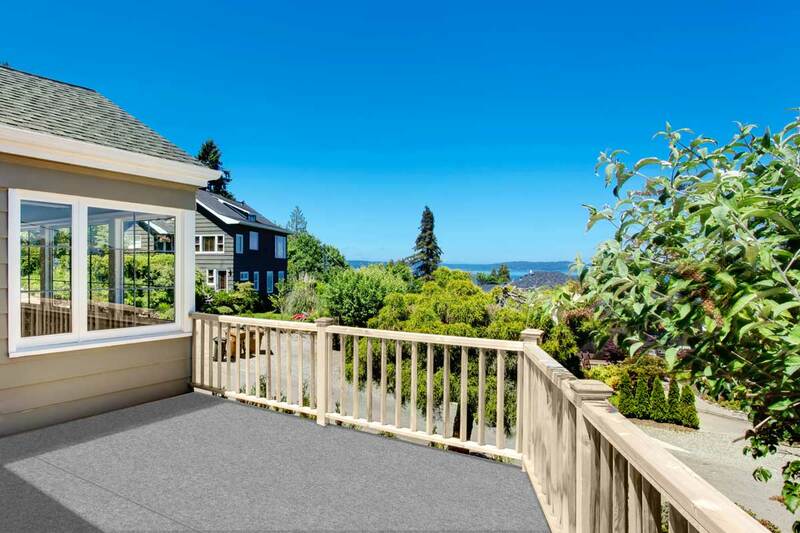 IntelliDeck offers waterproofing advantages of other flat roof options, but with the added benefit of also acting as an aesthetically pleasing, code compliant membrane that home owners desire. Once our vinyl membrane is installed, you can be confident that the structure and the living space will be shielded against the weather for years to come. IntelliDeck is also an easy solution to add new life and protect concrete walkways and patios. IntelliDeck exceeds the ADA slip requirements and is code approved as a certified roofing membrane that meets AC75 & AC39, therefore making it a “walkable” roofing membrane. 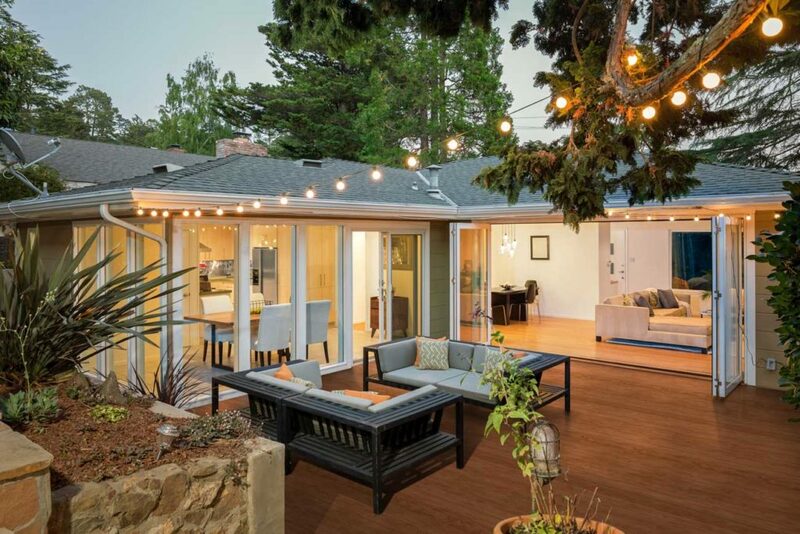 Why is IntelliDeck better than a pressure treated wood deck? Lowest cost of ownership of any decking material including; pressure treated lumber as well as wood plastic composite and their competitors. Low maintenance product only requiring semi-annual cleaning with a pressure washer not exceeding 1500 psi or a brush and luke warm soapy water. One step water-proof membrane that protects the substructure lumber for long life as well as waterproofs any living space underneath the deck. Note that PT and Composites require a separate, expensive water proof system to accomplish the same goal. Slip resistant product whether wet or dry. 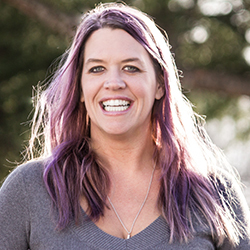 Meets American Disabilities Acts (ADA) requirements. 15 year limited manufactures warranty on material. Supplemental installation warranty may be provided by the installer. Eco-friendly, no trees are ever cut down to manufacture IntelliDeck. 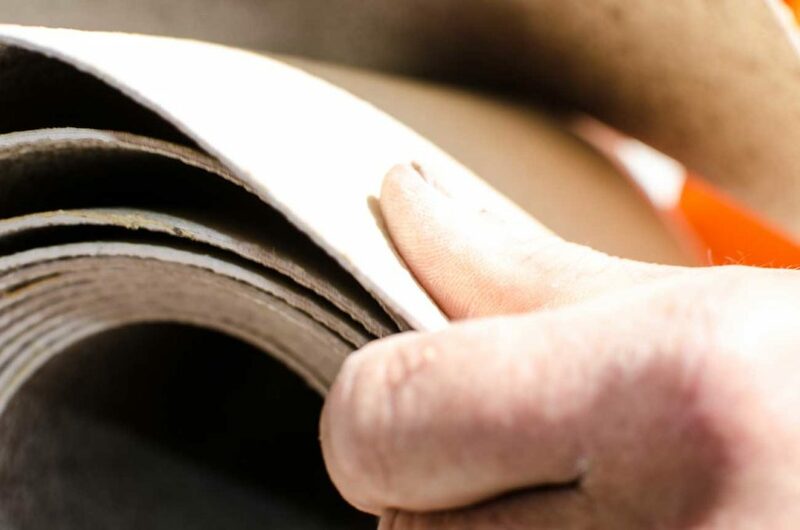 IntelliDeck uses a high percentage of post consumer recycled content in its construction, with little to no waste. 100% made in the USA by a company that has been in business since 1896. Why is IntelliDeck better than a composite deck? 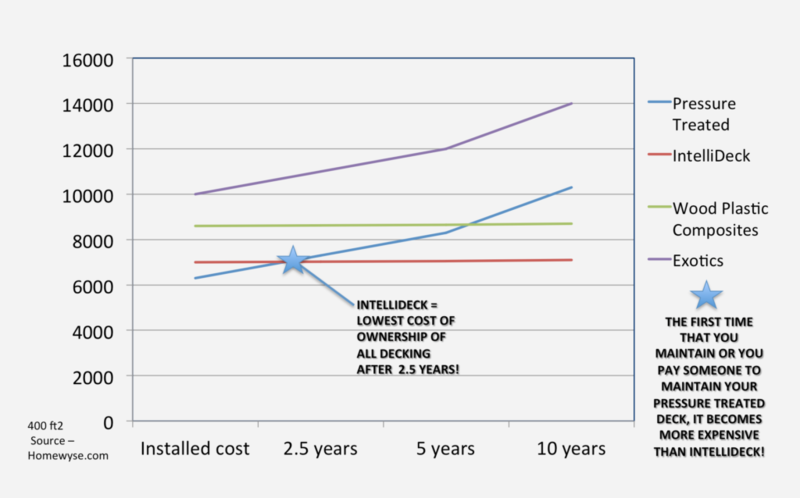 IntelliDeck offers the lowest cost of ownership of any decking product. 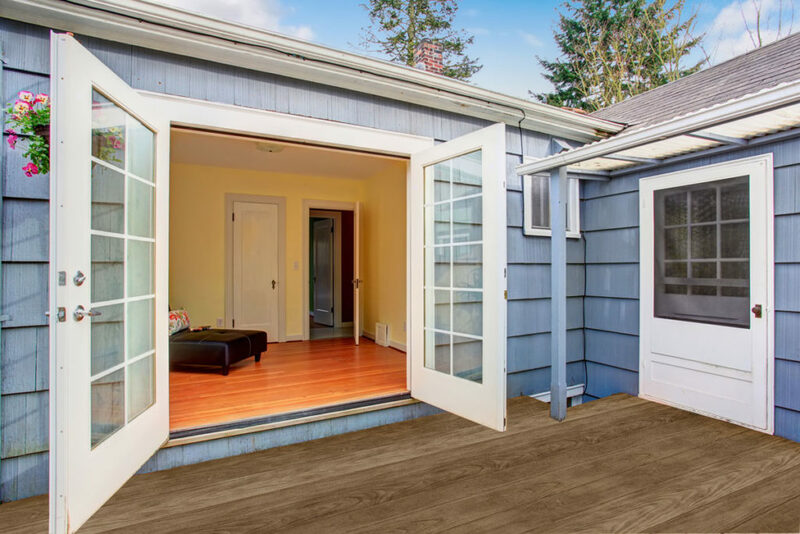 IntelliDeck is a 1 step waterproof solution that protects the decking substructure (increasing its lifespan) and waterproofing any living spaces underneath the deck. Composite decking does not waterproof the substructure or any living spaces underneath. To do so requires a 2 step process that adds costs to an already expensive installation. 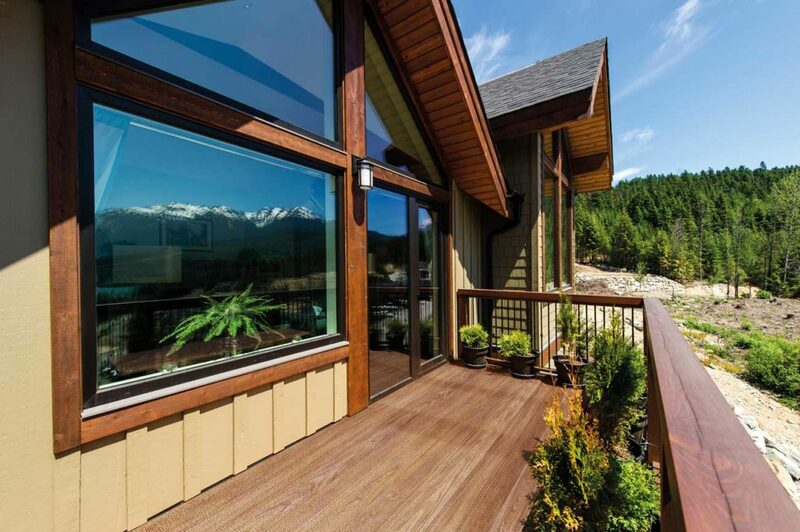 IntelliDeck’s original product has a 20 year track record in the extreme climate of Western Canada with zero warranty claims, while Composite decking has many class action lawsuits against it. Composite Decking requires large gaps in between boards when installed properly. These gaps can trap debris and high heels. IntelliDeck has no gaps. Where do I buy IntelliDeck? Homeowners: You would buy IntelliDeck from your local IntelliDeck Factory Trained Installer. 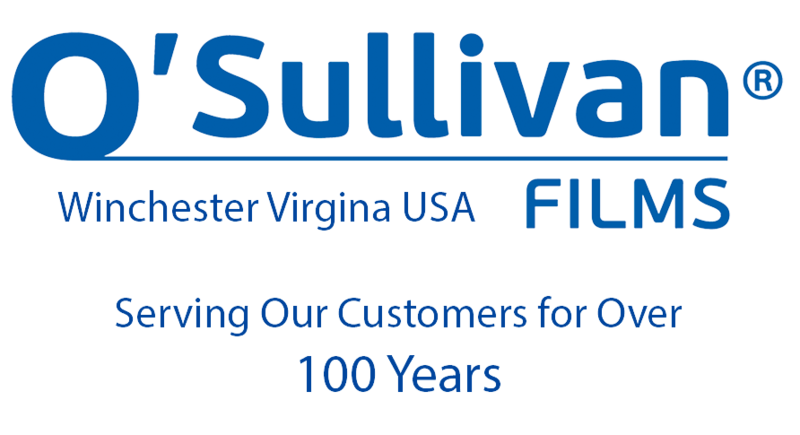 Contractors: Please contact us, and we can get you into our Winchester facility for training, so we can direct homeowners to you. We typically host training the 3rd Thursday and Friday of each month. The installation of IntelliDeck takes 8 steps. The substructure for an IntelliDeck deck is 90% the same as for any decking material. There is no need to use pressure treated/chemically treated lumber as IntelliDeck is a one step waterproofing product. Step 1- Frame it– Build the 16 inch on center frame of the deck. Step 2 – Cover it– Tongue and Groove plywood is “glued and screwed” to deck joists. 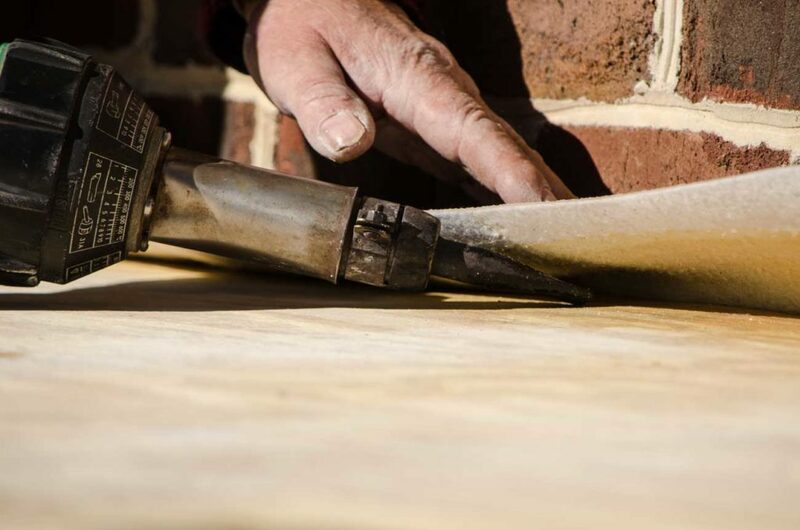 Step 3 – Sand it– Sand the surface to ensure that it is flat. Step 4 – Glue it– Apply glue. Step 5 – Adhere it– IntelliDeck is fully adhered to the plywood. Step 6 – Weld it– Any IntelliDeck seams and details are heat welded to ensure that they don’t leak. Step 7 – Fasten it– Mechanically fasten perimeter. Step 8 – Enjoy it! Does IntelliDeck come with a warranty? Yes! IntelliDeck™ offers an industry leading 15 year pro-rated warranty. How is IntelliDeck shipped and delivered? IntelliDeck is shipped via LTL carrier to your shop, house, or jobsite. IntelliDeck can be shipped as 1 roll or a skid of up to 10 rolls. Express shipping can be arranged at a modest extra cost. Please note that appointments must be made for residential delivery. Please Contact Lindsey for estimated shipping times. What designs is the product offered in? IntelliDeck™ is .060” thick x 72” wide and each comes in a 25 yard roll.